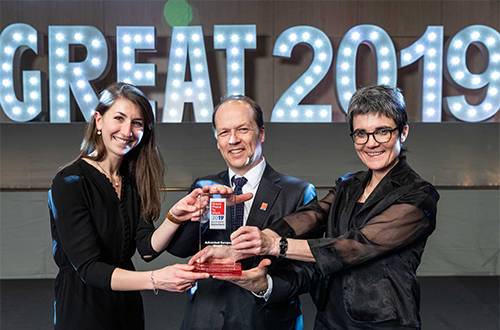 MUNICH, Germany – April 4, 2019 – Advantest Europe GmbH has been recognized for the second time as one of “Germany’s Best Employers” by the internationally-renowned consulting firm, Great Place to Work®. The annual competition ranks German companies of all sectors and sizes based on the attractiveness of their corporate culture in order to determine the 100 best employers nationally. The award symbolizes an attractive workplace culture, characterized by a high degree of trust, pride, appreciation and team spirit, as well as a strong sense of identity of the employees within their company. The award was presented to Advantest Europe GmbH at an award ceremony on March 14, 2019 in Berlin. Advantest was ranked 19th in its inaugural participation in the competition in 2017. In this second year of participation, the company was elevated to 11th place in the category of companies with 501 to 2000 employees. A total of 680 companies took part in the nationwide 2019 benchmark survey. In addition to the “Germany’s Best Employers 2019” award, Advantest Europe GmbH is also ranked among the "Best Employers 2019" in Germany’s information and telecommunication (ITK) sector and as a “Best Employer” in the Bavarian region. While the company is ranked third out of a total of 167 participants in the "Best Employers in ITK" competition, it achieved the fourth place out of a total of 155 participating companies in the "Bavaria's Best Employers" competition. “A trusting dialogue, along with a collaborative environment, that respects and encourages inputs from employees have molded our unique corporate culture and contribute to our earning this distinction. We are very pleased that our employees have repeatedly confirmed that Advantest offers them more than just a job, and that the people and culture of the company make it a great place to work overall. The result makes us very proud and we appreciate the strong commitment, support and dedication of each individual,” says Peter Wewerka, Managing Director of Advantest Europe GmbH. Great Place to Work® is an international research and consulting network, which supports companies in around 50 countries worldwide in shaping an employee-oriented corporate culture. The focus in this respect are the building of confidence, enthusiasm and team spirit.